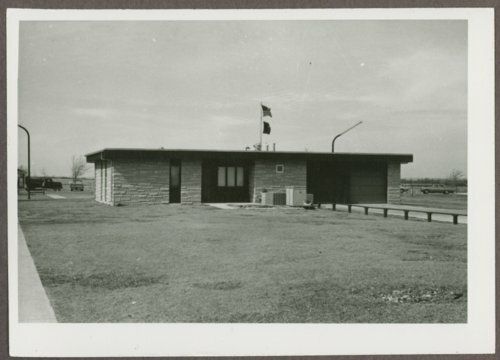 This is a photograph of the visitor center at Fort Hays, Kansas. Fort Hays was an important U.S. Army post that was active from 1865 until 1889. Originally designated Fort Fletcher (after Governor Thomas C. Fletcher of Missouri), it was located five miles south of present-day Walker and became operational on October 11, 1865. Troops stationed at Fort Fletcher were to protect the stage and freight wagons on the Butterfield Overland Despatch (BOD), traveling along the Smoky Hill Trail to Denver. Despite the presence of the soldiers, Southern Cheyenne and Southern Arapaho Indians continued to confront traffic along the trail. David Butterfield, owner of the BOD, went bankrupt and the line was abandoned. Since the Smoky Hill Trail was no longer in use, Fort Fletcher was closed May 5, 1866. On October 11, 1866, Fort Fletcher was reopened approximately one-fourth mile north of its previous location, at the confluence of Big Creek and the North Fork of Big Creek. The Union Pacific Railway, Eastern Division, was being constructed westward roughly paralleling the Smoky Hill Trail and construction workers needed the protection of the U.S. Army. In November 1866, Fort Fletcher was renamed Fort Hays in honor of Brigadier General Alexander Hays, who was killed during the Civil War. Some of the famous figures associated with the fort included Wild Bill Hickok, Buffalo Bill Cody, General Nelson Miles, General Philip Sheridan, and Lieutenant Colonel George Armstrong Custer. It was also the home of several well-known Indian wars regiments such as the Seventh U.S. Cavalry, the Fifth U.S. Infantry, and the Tenth U.S. Cavalry, whose black troopers were better known as Buffalo Soldiers. After 25 years of service, Fort Hays was abandoned on November 8, 1889. Today four original buildings survive: the blockhouse (completed as the post headquarters in 1868), guardhouse, and two officers' quarters. After its closing in 1889, the land and buildings of Fort Hays were turned over to the U.S. Department of the Interior, which later transferred them to the state of Kansas in 1900. When Frontier Historical Park was opened at the site in 1929, only the blockhouse and guardhouse remained of the original fort buildings. The two officers' quarters had been sold at auction in 1902 and moved into Hays, Kansas, at the time the other buildings were being sold for scrap. The officers' quarters were relocated to the fort site in 1964 and 1987. The visitor center was built in 1967. Today, the Kansas Historical Society operates it as Fort Hays State Historic Site; it was added to the National Register of Historic Places in 1971. This is a photograph of the visitor center at Fort Hays, Kansas. Fort Hays was an important U.S. Army post that was active from 1865 until 1889. Originally designated Fort Fletcher (after Governor Thomas C. Fletcher of Missouri), it was located five miles south of present-day Walker and became operational on October 11, 1865. Troops stationed at Fort Fletcher were to protect the stage and freight wagons on the Butterfield Overland Despatch (BOD), traveling along the Smoky Hill Trail to Denver. Despite the presence of the soldiers, Southern Cheyenne and Southern Arapaho Indians continued to confront traffic along the trail. David Butterfield, owner of the BOD, went bankrupt and the line was abandoned. Since the Smoky Hill Trail was no longer in use, Fort Fletcher was closed May 5, 1866. On October 11, 1866, Fort Fletcher was reopened approximately one-fourth mile north of its previous location, at the confluence of Big Creek and the North Fork of Big Creek. The Union Pacific Railway, Eastern Division, was being constructed westward roughly paralleling the Smoky Hill Trail and construction workers needed the protection of the U.S. Army. In November 1866, Fort Fletcher was renamed Fort Hays in honor of Brigadier General Alexander Hays, who was killed during the Civil War. Some of the famous figures associated with the fort included Wild Bill Hickok, Buffalo Bill Cody, General Nelson Miles, General Philip Sheridan, and Lieutenant Colonel George Armstrong Custer. It was also the home of several well-known Indian wars regiments such as the Seventh U.S. Cavalry, the Fifth U.S. Infantry, and the Tenth U.S. Cavalry, whose black troopers were better known as Buffalo Soldiers. After 25 years of service, Fort Hays was abandoned on November 8, 1889. Today four original buildings survive: the blockhouse (completed as the post headquarters in 1868), guardhouse, and two officers' quarters. After its closing in 1889, the land and buildings of Fort Hays were turned over to the U.S. Department of the Interior, which later transferred them to the state of Kansas in 1900. When Frontier Historical Park was opened at the site in 1929, only the blockhouse and guardhouse remained of the original fort buildings. The two officers' quarters had been sold at auction in 1902 and moved into Hays, Kansas, at the time the other buildings were being sold for scrap. The officers' quarters were relocated to the fort site in 1964 and 1987. The visitor center was built in 1967. Today, the Kansas Historical Society operates it as Fort Hays State Historic Site; it was added to the National Register of Historic Places in 1971.